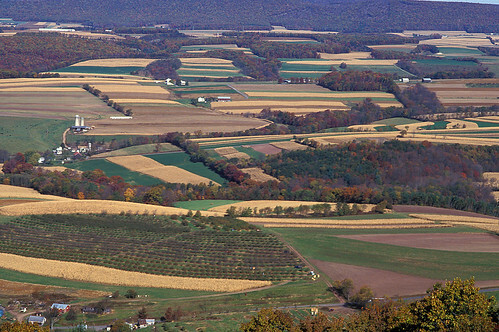 New jointly-developed USDA apps will help promote sustainable land-use practices. ARS photo by Scott Bauer. Seems like there’s an “app” (application) for everything these days—perhaps because mobile phone use is becoming increasingly global. USDA’s Agricultural Research Service (ARS) soil scientist Jeff Herrick and colleagues have jumped on that trend in their efforts to promote sustainable land-use practices and world food security. This past April, they released the first two of a suite of mobile phone apps that, once all are issued, will connect agricultural producers around the world and provide them with shared knowledge on ways to maximize their land’s productivity while protecting its resources for future generations. The two apps, dubbed “LandInfo” and “LandCover,” can be downloaded from the Google Play Store and are currently available for use on Android phones only. However, other platforms, including iPhones, may be available by year’s end, noted Herrick, with ARS’s Range Management Research Unit in Las Cruces, New Mexico. Herrick helped develop, test and release the apps as part of a five-year, multi-organization project called the “Land Potential Knowledge System” (LandPKS). The U.S. Agency for International Development, New Mexico State University, USDA-Natural Resources Conservation Service, Africa Technology Policy Studies Network, and World Agroforestry Center are among the participants. “The LandPKS is a global network of open-source databases and computer simulation models that anyone with a mobile phone and a wireless or cellular data connection will be able to access,” explained Herrick. The apps use the latest in digital soil mapping, GPS-enabled camera functions and Cloud-computing technology, but require no special training—thanks to picture-matching, drop-down menus, explanatory video and multiple-choice questions. With LandInfo, for example, users can collect and share soil and land-cover information as well as gain access to global climate data. The app also provides some useful feedback, including how much water the soil can store for plants to use, average monthly temperature and precipitation, and growing season length. LandCover simplifies data collecting for use in land-cover inventories and monitoring. In fact, a yard or meter stick with five notches is all that’s needed to document tree, grass, bare-ground and crop-residue cover. The app automatically generates basic indicators of these cover types on the phone and stores the data on servers that are accessible to users worldwide. A future app (LandPotential) will use the LandInfo data together with Cloud-based models and additional knowledge bases to help users identify and select management systems that increase production while reducing soil erosion. Herrick said this type of shared knowledge will become especially important as agricultural producers seek to meet the food, fiber, fuel and feed needs of a growing world population projected to reach 9 billion individuals by 2050. Visit LandPotential.org for more information about the apps and LandPKS project. Smart Phones are a boon for farmers. There are several farming related apps that help guide farmers get the best out of their land and produce. From latest farming techniques, to best tools, weather updates, and a whole lot more information is available through mobile apps.